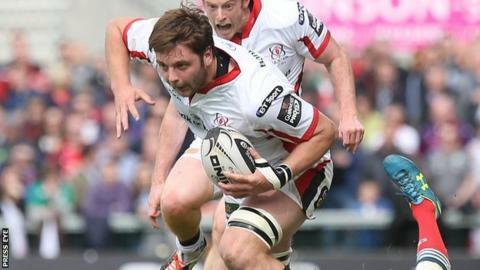 Flanker Iain Henderson is available for Ulster's Pro12 title bid after having his red card against Munster rescinded by a disciplinary committee in Wales. The back-rower was dismissed late in the 23-23 draw in Belfast on Saturday for careless use of the head at a ruck. However, the committee concluded that Henderson's initial contact with his opponent "had not in fact been with his head but with his arm". It is a massive boost for Ulster ahead of Saturday's clash with Glasgow. The Ireland international appeared before the committee, which viewed the incident involving Henderson and Munster's Ronan O'Mahony. It said it viewed the incident in close-up, adding that referee Nigel Owens had not been able to do this at the time. The committee "having viewed the footage and listened to representations by and on behalf of Mr Henderson, decided that the act did not warrant a red card". "The Disciplinary Committee imposed no sanction on the player, who is free to resume playing immediately." Ulster coach Neil Doak said on Tuesday that the Irish province was hopeful of mounting a strong defence in red-card hearing. Henderson could have been banned for the rest of the season if the red card was upheld by the committee. Ulster will play Glasgow Warriors before a Pro12 semi-final on 22/23 May. The province lie fourth in the standings and victory at Scotstoun this weekend, in the final round of games, could leave Doak's side with a home semi-final. Victory in the semis would take Ulster to the Grand Final on 30 May at their home ground, Kingspan Stadium in Belfast.